There has been more interest in California earthquake prediction since the 2011 Japan earthquake and tsunami. California is prone to earthquakes and many of our readers come from this densely populated state. The nuclear emergency in Japan has implications for California as there are two nuclear power stations operating in the state. The Diablo Canyon Power Plant is in a danger zone. “the Hosgri fault, had been discovered several miles offshore. This fault had a 7.1 magnitude quake 10 miles offshore on November 4, 1927” . The San Onofre Nuclear plant is further south, both are located directly on the coast. Given what we have seen in Japan, is that smart or dumb? I’ve put a dozen charts in my file from major earthquakes in California over the last 150 years. One thing I noticed is that on most occasions, there was an eclipse visible in California beforehand, mostly lunar eclipses. The map on the right is for the lunar eclipse before the 1906 earthquake. Another common link was conjunctions, squares and oppositions involving the outer planets. I compared the major quakes to the mundane horoscope of America, California, and San Francisco but didn’t find anything startling. I did find a strong correlation between two of the strongest and deadliest earthquakes in California, and the degrees of the zodiac that were in common are going to be heavily triggered in late 2012 and into 2013. The two earthquakes were the 1906 San Francisco earthquake, magnitude 7.8 which killed over 3000 people. 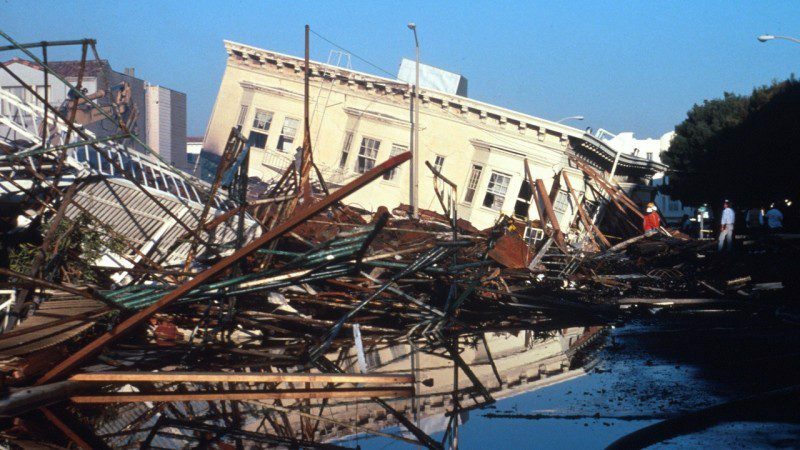 The other one was in the same region, the 1989 Loma Prieta earthquake, magnitude 6.9 which killed 63 people. >The charts for these earthquakes only show the major aspects of interest to keep it simple. The 1908 San Francisco earthquake had Uranus opposite Neptune. The 1989 Loma Prieta earthquake had Saturn and Neptune opposite Jupiter, on the same Cancer/Capricorn axis, same degrees even. There are two reasons I believe that these previous major earthquakes are important for California earthquake prediction. The first reason is because of eclipses. The lunar eclipse a couple of months before the 1906 earthquake was totally visible in California as you can see in the picture left. The lunar eclipse a couple of months before the 1989 earthquake was also visible, though it was not as close. Looking ahead, in May 2012, a solar eclipse spans the Pacific Ring of Fire. It starts in Japan and ends in Texas, passing just to the north of San Francisco. The solar eclipse in May 2012 coincides with the beginning of some major planetary alignments aspecting both the 1906 and 1989 earthquake charts. The most important of these is from Uranus square Pluto, with Pluto around 9 Cancer. July 2011, Solar Eclipse opposite Uranus, conjunct Neptune. South Node conjunct Pluto. 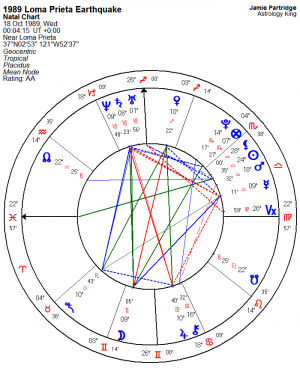 March 2012, Pluto square Mercury, Pluto opposite Neptune, Neptune conjunct Moon, Saturn opposite Sun, and South Node conjunct Jupiter. May 2012, the Solar eclipse passing over northern California, Pluto square Mercury, Pluto opposite Neptune, Jupiter conjunct Mars. December 2012 to January 2013, Pluto square Mercury, Pluto conjunct Uranus, Pluto opposite Neptune, Neptune conjunct Moon, South Node conjunct Mars, Jupiter Yod conjunct Jupiter. April 2013, Uranus conjunct Mercury, Uranus square Uranus, Uranus square Neptune. August 2013, Pluto square Mercury, Pluto opposite Neptune, Jupiter square Mercury, Jupiter opposite Uranus, Jupiter conjunct Neptune. October – November 2013, Pluto square Mercury, Pluto conjunct Uranus, Pluto opposite Neptune, Uranus conjunct Mercury, Uranus square Uranus, Uranus square Neptune, Saturn opposite Venus. The two highest risk periods look like August 2013 with the Jupiter Pluto opposition hitting the Cancer-Capricorn axis, and then October November 2013 with the Uranus Pluto square hitting that axis. I think with the 7.9 quake up in Alaska yesterday us here in SoCal should be on alert, especially with a lunar eclipse next week. Feb 20/2018, Jamie, im thinking this is it. One might chart the full moon for July 27th (2018) for Astoria, Oregon or town of similar longitude and latitude. 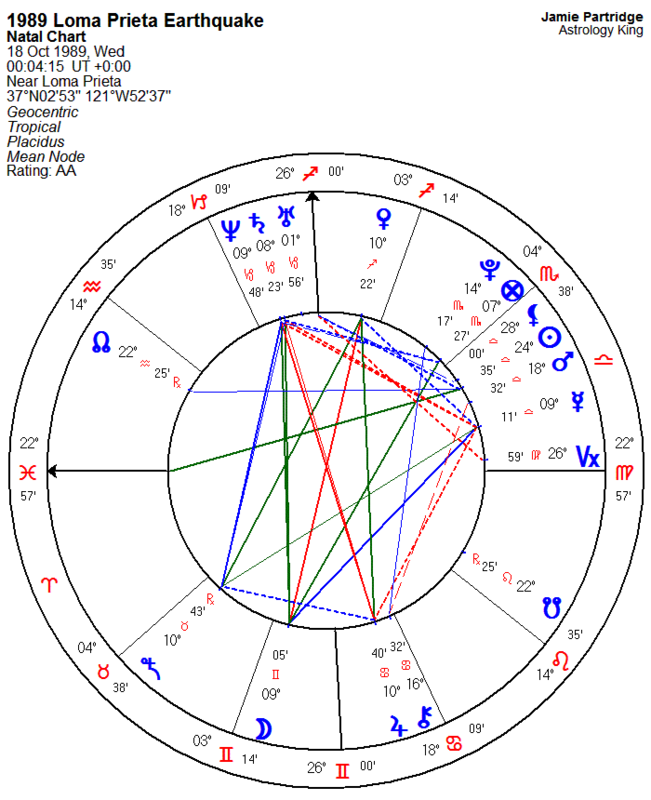 The Sun-Moon lies precisely at the MC/Nadir Axis with Mars and Uranus chipping in doing their part. As the Moon has transited Saturn and soon Pluto one might, in approach, examine any cluster or quake patterns along the Pacific Coast of the Americas, as well as Yellowstone and Southern Iran. The cluster earlier today off the coast near Gold Beach has me watching the Pacific faults and what happens on the opposite side of the earth as we approach and pass through this lunar eclipse. Observe world events as well with an open mind. Oddly some ancient or indigenous dance rituals meant to appease may accompany the “no-show” that usually characterizes one’s deflated anticipation of something earth-shaking. Most definitely Calfornia is due an earthquake soon.